For the second-straight week, just 39 drivers are entered to attempt this Sunday’s Cup event, the 9th short field in 14 races. It also marks the shortest Cup field at Pocono since June 16, 1991, when James Hylton trailed a 37-car field for the Champion Spark Plug 500 after engine issues on his #48 Hylton Racing Chevrolet. It isn’t quite the same 39-car list from last week at Dover. Missing this week is Motorsports Business Management’s #66 Chevrolet, which Timmy Hill drove to a season-best 28th last week. Hill and team owner Carl Long are instead entered in Saturday’s XFINITY race with Hill in the #13 Toyota and Long in the #40 Dodge. In Hill’s place on the Cup side is Derrike Cope, who this week runs with sponsorship from StarCom Fiber on Premium Motorsports’ #55 Chevrolet. After skipping last week’s race at Dover, Cope will make his first Pocono start since July 27, 2003, when he finished 42nd in the #37 Friendly’s Ice Cream Chevrolet, a car he owned under his old team Quest Motor Racing. Reed Sorenson returns as Cope’s teammate at Premium Motorsports to drive the #15 Chevrolet. Last Sunday at Dover, this car got much more screen time than usual when Ross Chastain’s triple-header was capped by a 20th-place finish in his Cup debut. Chastain, who also remained on the lead lap for most of the race, does not as yet have plans for future Cup races, but with that finish, that could certainly change. Also back in his old car is Corey LaJoie, back behind the wheel of BK Racing’s #83. The team had a solid run of its own last week as Ryan Sieg made his Cup debut, rebounding from an early spin to come home 26th. While LaJoie's teammate Gray Gaulding has never raced at Pocono before, LaJoie claimed his second ARCA Racing Series victory there in 2013, beating Frank Kimmel by more than 17 seconds in a car fielded by his father Randy. While Ty Dillon’s heartbreaking crash in overtime on Sunday ended an all but certain first Top 5 finish, he and the Germain Racing team may again be ones to watch this Sunday. In two previous runs during the spring race at Pocono, Dillon finished 18th and 21st, each time coming home on the lead lap. He also finished a strong 3rd in the XFINITY race here last year. Also involved in the Dillon crash was Cole Whitt, whose unsponsored #72 Chevrolet was on its way to a decent finish of its own. Whitt was running so well in the closing stages that, even with his car wrecked and unable to finish, he came home 22nd, his best finish in seven starts at the track. It also tied car owner Mark Smith’s best performance at Dover since 1994, when Loy Allen, Jr. came home in the same spot. Like Ty Dillon, Whitt could be one to keep an eye on at Pocono. Two of his best runs on non-plate tracks in 2016 came at the track, where he ran 30th and 31st for Premium Motorsports. Kudos to Jeffrey Earnhardt and Circle Sport with The Motorsports Group, who last week landed their first major multi-race sponsor with the Hulu online streaming service. Following their 27th-place finish at Dover – tied with Bristol for their second-best finish of the year – Hulu will sponsor the #33 Chevrolet for 18 of the season’s remaining 22 races on a schedule to be announced. Congratulations are also in order to Darrell Wallace, Jr., who on Monday was announced to be making his Cup debut in Richard Petty Motorsports’ #43 Smithfield Ford. Wallace, who finished 16th in last year’s XFINITY race at Pocono, will certainly be looking for a strong finish as sponsor troubles have exacted their toll on his XFINITY effort. A report on Monday indicated that Roush-Fenway Racing that, despite running 4th in points, they will suspend operations of the #6 team after Pocono. The #6 that Wallace drives on Saturday will be sponsored by “Cars 3,” a tie-in with Wallace’s cameo in the upcoming Disney/Pixar film. 41 drivers are entered to make Saturday’s 40-car field – the same 40 teams from last week at Dover with the addition of Casey Mears in the #98 Fresh From Florida Ford. 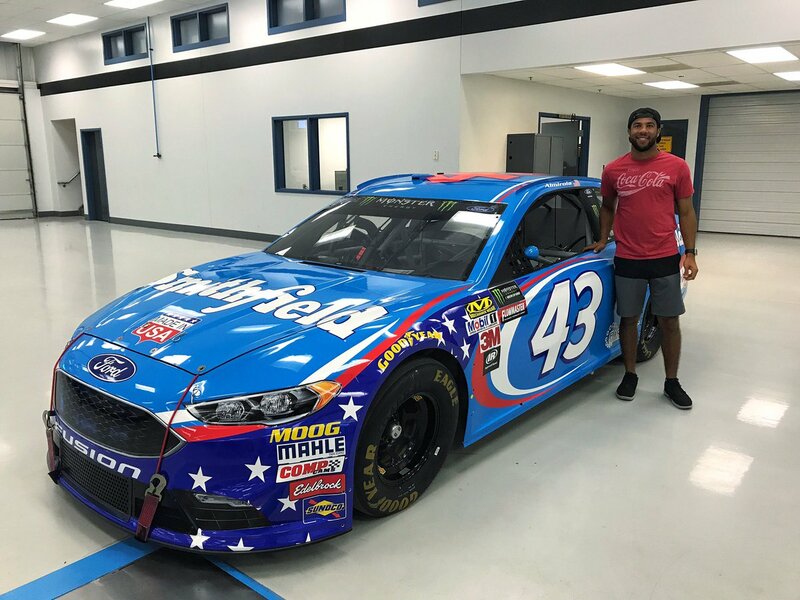 After the Biagi DenBeste Racing team skipped last Saturday’s race at Dover, the team will look to improve on their 11th-place run at Pocono last year with the injured Aric Almirola. Last Saturday at Dover, B.J. McLeod’s #78 team picked up its third-best finish of the year with fan favorite Jordan Anderson, who came home 26th despite late-race suspension issues. This week, McLeod brings on fellow Truck Series underdog Tommy Joe Martins, who for the first time in his XFINITY career will drive for a team other than his own. Martins, who has yet to make an XFINITY start this year, ran 17th in last year’s Truck race at Pocono. Anderson will return to RSS Racing’s #93 Chevrolet, a team which continues to run away with this year’s LASTCAR championship. Josh Williams returns to the XFINITY Series for his second start of the year, his first since a 22nd-place finish at Bristol. Then, as now, he drives the #90 BuckedUp Apparel Chevrolet for Mario Gosselin. Last week, Brandon Brown tied the Gosselin team’s best finish of the year at Daytona with a 17th-place finish of his own. Deciding which car will be sent home could come down to owner-drivers Morgan Shepherd and Mike Harmon, who are both entered this week. Shepherd added to his extensive career at Pocono by running the inaugural XFINITY race last year, finishing 35th with a vibration after the halfway point. Harmon finished the race under power in 30th, three laps down. Just 26 trucks are entered to attempt the 32-truck field for this Friday’s race in Texas, which is tied for the third-shortest field in series history. The last time this few drivers started a Truck Series race was October 7, 1995, when Dennis Dyer trailed the 26-truck field of the Subway 100 at the Sonoma Raceway with handling issues. This not only indicates continuing struggles for the Truck Series, but for Texas Motor Speedway itself – the track hosted a 27-truck field in 2014. There is a possibility the list will grow by at least one as Jordan Anderson has tweeted his #1 TJL Motorsports entry is being prepared to run the race. Among the other teams missing? Kyle Busch Motorsports hasn’t entered the #46 with which Todd Gilliland made his series debut last week. Beaver Motorsports, though often a late entry, is as of this writing not listed with their #50 Chevrolet. Neither is Charlie Henderson’s #75 for Parker Kligerman or Ricky Benton’s #92 Ford for Regan Smith. Jesse Little made a dramatic return to the series last Friday, qualifying 5th and finishing 14th, but the #97 Toyota is again missing this week. Copp Motorsports has only entered the #83 Chevrolet to be driven by Todd Peck, and has not yet included the second #36 Chevrolet driven last week by J.J. Yeley. Yeley’s truck did help fill the field at Dover, and might be brought out again this week on that basis alone. Though listed as “to be announced” on the entry list, MDM Motorsports’ #99 Chevrolet will be driven by Timothy Peters this week, following a report published on Sunday. Out of a ride when Red Horse Racing closed its doors after Charlotte, Peters slipped from 5th to 9th when he couldn’t get a ride at Dover, and will hope to piece together the rest of his 2017 campaign. Justin Haley, who ran a season-best 8th last week at Dover, returns for his fifth-straight start in GMS Racing’s #24 Chevrolet. As of this writing, Haley’s truck is one of eight – including Timothy Peters’ #99 – whose sponsors are still to be determined. Austin Wayne Self’s partial schedule continues at his home track this week, and he will drive his family’s #22 Don’t Mess With Texas Toyota for the first time since his 12th-place run at Charlotte. Self finished 13th at the track last year. One to watch has to be Myatt Snider, who we last saw finishing 10th in the season opener at Daytona. Since then, Snider scored the victory in last month’s Short Track U.S. Nationals at Bristol, leading 80 of 100 laps and winning from the pole. Snider will again run Kyle Busch Motorsports’ flagship #51 Toyota with his continuing sponsor Louisiana Hot Sauce. 26 trucks. I've seen IndyCar and F1 fields that size. Great entry list we have here. Something's gotta change. Thank you both for your readership. Dane, you are correct that the 36 was a Mittler entry - Justin Jennings and Blake Koch are among the drivers who both raced and finished last with that number. But at least under Racing-reference, the 36 has become a second Copp entry alongside the 83. I'm very curious to learn more about the tie between Mittler and Copp and am continuing my research.